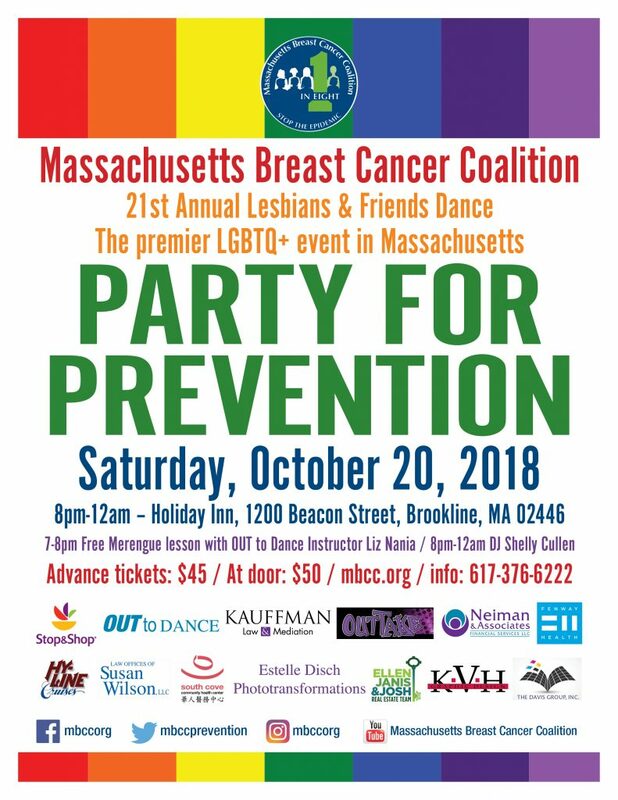 The October 2018 Lesbians & Friends Dance: A Party for Prevention is a benefit for Massachusetts Breast Cancer Coalition (MBCC), Massachusetts’ leading breast cancer organisation, with the unique goal of breast cancer prevention. This event for the New England LGBTQ+ community will be held on Saturday, October 20, from 8:00pm-12:00am at the Holiday Inn Brookline, located on 1200 Beacon Street in Brookline, MA. Highlights for the 21st annual dance event include a free one-hour dance workshop, available to all dance participants, from 7:00 – 8:00 pm, led by Liz Nania, Director of Out to Dance; music from DJ Shelly Cullen; a large silent auction; complimentary hors d’oeuvres, and a cash bar. Tickets are $45 in advance ($20 for students) or $50 at the door ($25 for students). To purchase tickets call 617-376-6222. Or for full event information, you can visit http://www.mbcc.org/.